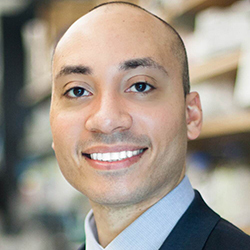 The next frontier in therapeutics development is the precise targeting of biologics and/or small molecule therapeutics to discrete cell populations within relevant organs. This will minimize undesirable side effects, decrease the therapeutic dosage and allow patient-specific tailoring of treatment regimen for precision medicine applications. Services provided for identifying molecular targets to home therapeutic molecules to specific sub-regions and cells within the kidney. 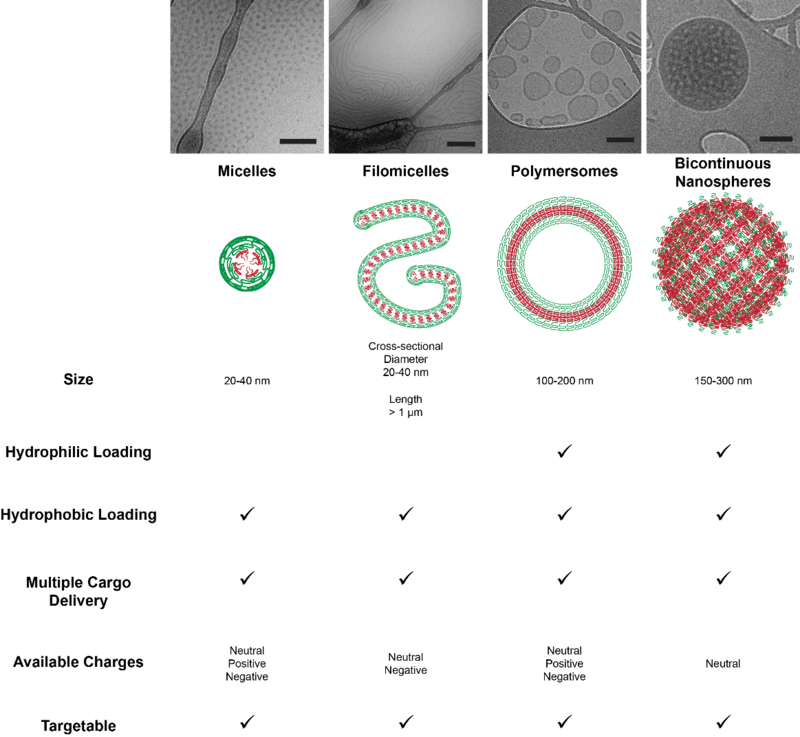 Engineering nanoarchitecture has resulted in numerous advancements in targeted drug delivery. Employing nanocarriers as vehicles to transport therapeutics provides increased circulation time, enhanced intracellular delivery and simultaneous loading of multiple molecules that differ in water solubility (Allen, Liu et al. 2016, Yi, Allen et al. 2016, Scott, Karabin et al. 2017, Karabin, Allen et al. 2018). Services provided for the scalable fabrication and therapeutic loading of synthetic nanocarriers. These nanocarriers are non-inflammatory and essentially function as “blank slates” with a therapeutic and immunostimulatory potential based solely upon their selected molecular payloads (Scott, Stano et al. 2012, Dowling, Scott et al. 2017, Bobbala, Allen et al. 2018). 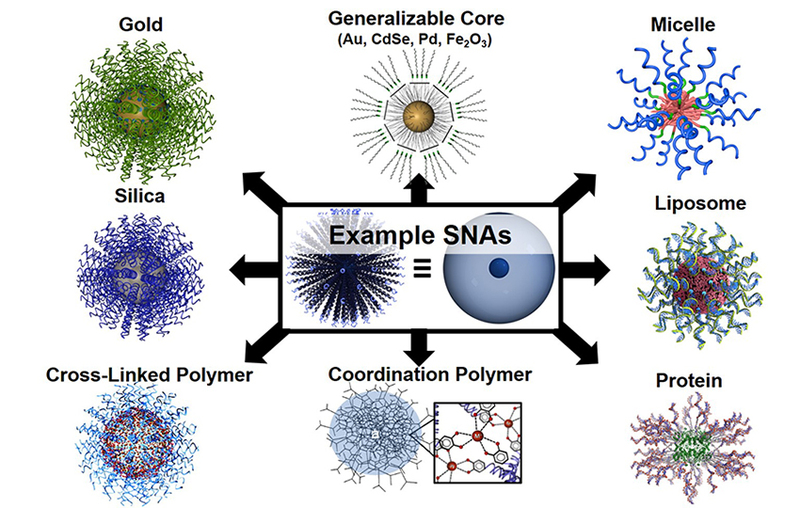 The panel above illustrates the variety of SNA formulations that are available through the International Institute for Nanotechnology (IIN). SNAs are comprised of radially pointing nucleic acids (oligodeoxynucleotides, ODNs) that are clustered around cores made from a variety of chemical and/or biological components. 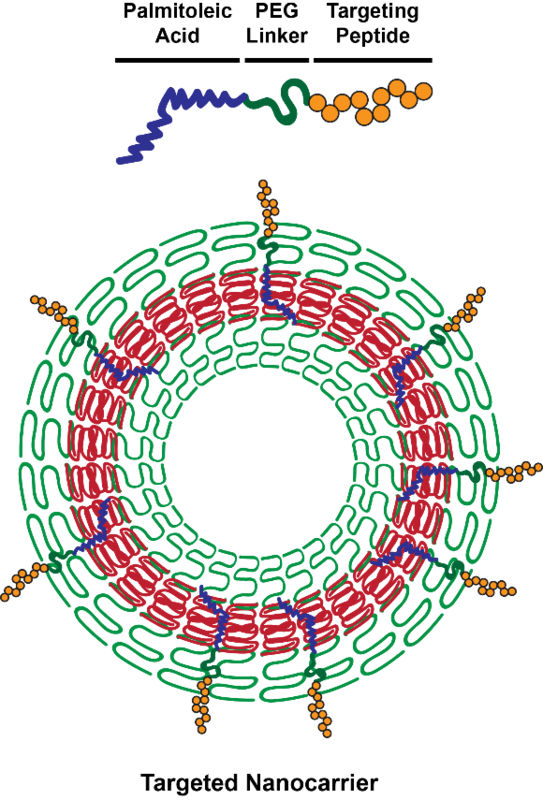 Traditional SNAs have used a gold (Au) templated formulation, but small unilamellar liposomes measuring ~50 nm in diameter allow for a different spectrum of biocompatibility and packaging options by permitting additional molecular agents to be encapsulated within the liposome core. The imaging resources within the NU Chemistry of Life Processes (CLP) Institute will provide validation of in vivo targeting of therapeutic agents to sub-regions within the targeted organ, such as the kidney.